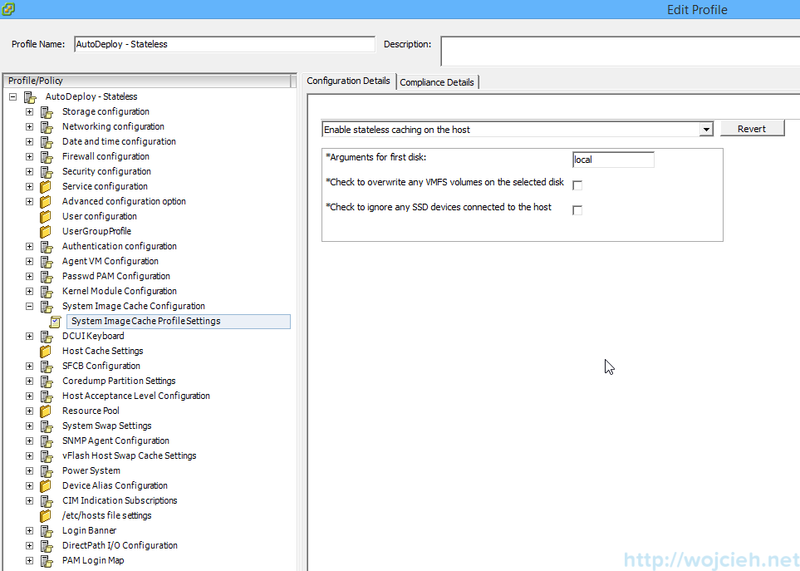 In the second part of Auto Deploy configuration guide, we will continue with setup and we will boot ESXi. 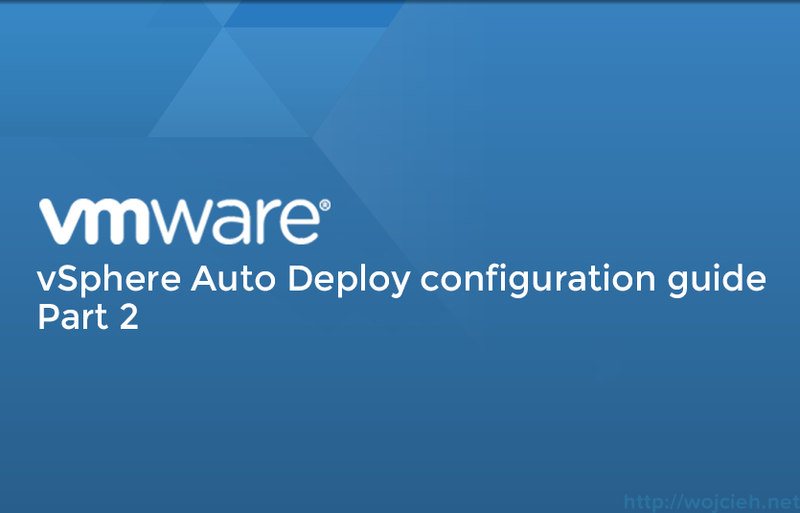 In order to provision ESXi hosts with Auto Deploy, we need to create Software Depot. In order to do it, you need to install PowerCLI. I am using latest version 5.5 which you can download from VMware website PowerCLI 5.5 Download link. 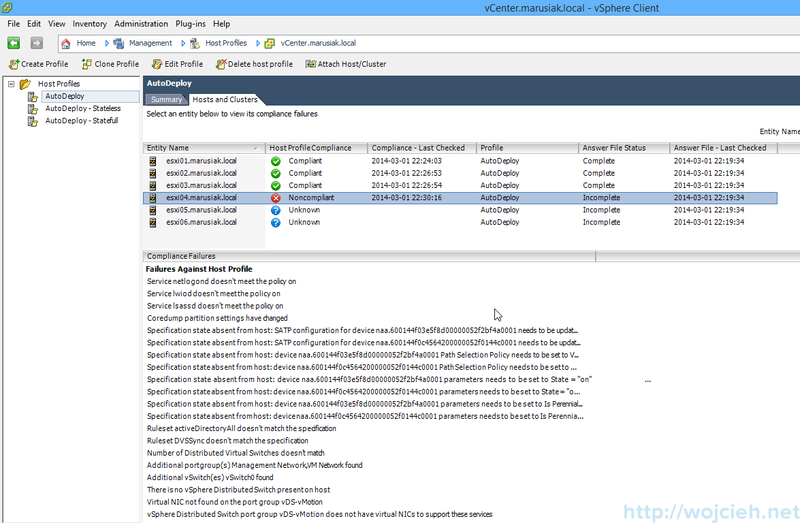 Connect to a vCenter server and start PowerCLI. After successful connection, we have to add ESXi Offline Bundle ZIP file into the repository. But hey, first we need to download it. As always you can find it on VMware website, but I will provide direct URL to file – ESXi 5.5 Offline Bundle. I placed it in following directory E:\SoftwareDepot\ and we add the repository using the following command in PowerCLI. And as you see Image is imported into Auto Deploy. After successful import, we just need to activate rule set by typing following command in PowerCLI. As you see on screenshot ESXi is booting using Auto Deploy. 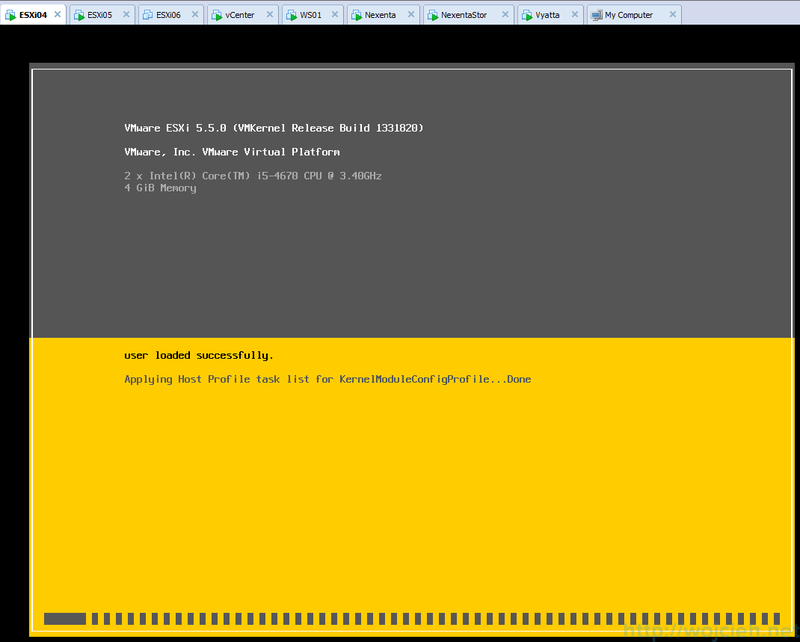 After successful boot from the network, we have three new ESXi hosts connected to vCenter. We see that deployment works fine but to make this easier and less time-consuming we will use Host Profile. 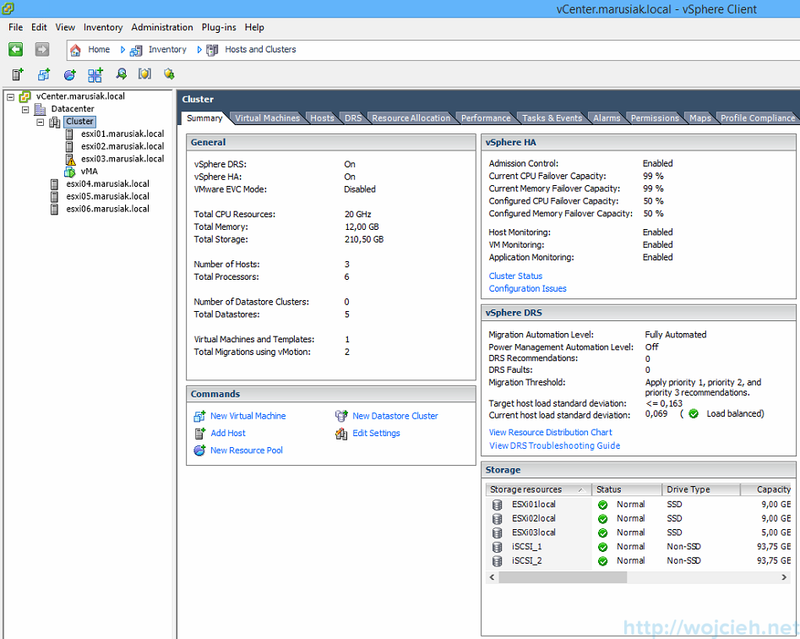 Host Profile is captured configuration of ESXi hosts (we can call it a template or golden image) which can be applied to other ESXi hosts to have consistent and standardized configuration in the environment. Select ESXi hosts which are already configured so when you will apply host profile to Auto Deployed servers they will be already configured. In order to do it navigate to Host and Clusters and select host. Click Host Profile and Create Profile from Host. Provide a name for host profile and/or description and click Finish. Go to Host Profiles and you will see that profile was created. In order to do more advanced and more automated deployment, we have to make adjustments in Software Depot. 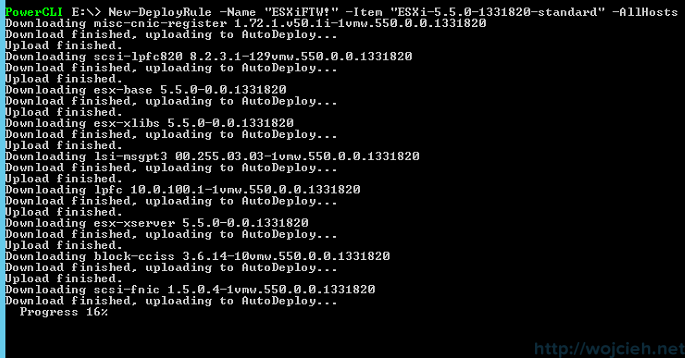 In just a few minutes we will create rules which will allow us to boot ESXi using Auto Deploy with enabled HA agent. The host will be added to the cluster and Host Profile will be applied. We add Software Depot – just VMware Offline Bundle. We add HA Software Depot from vCenter. We clone existing depot to add HA features. If you will be asked for vendor type it. In my case, it is VMware, Inc.
New-EsxImageProfile -CloneProfile "ESXi-5.5.0-1331820-standard" -name "ESXi_5.5"
We add HA features into an ESXi_5.5 profile. 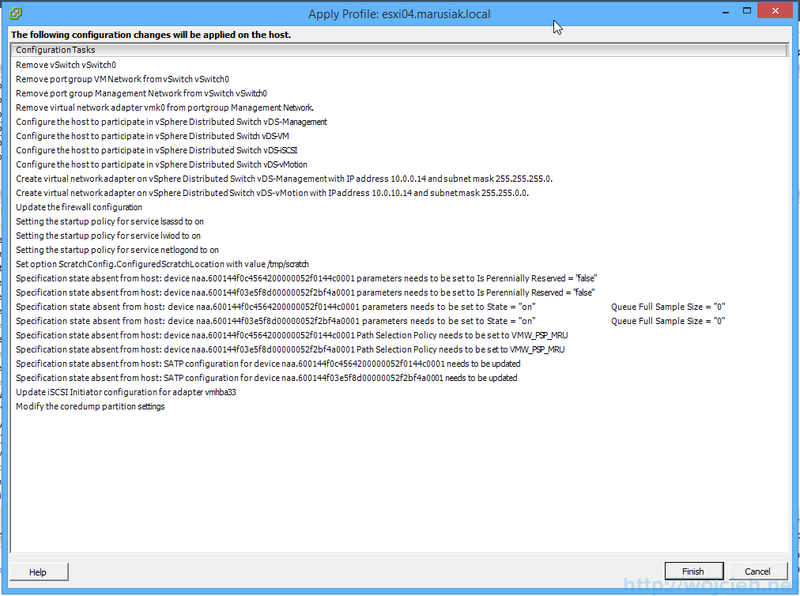 It is good to export newly created profile into Offline Bundle to store it locally after all changes we did. In order to do that use following command. We will create deployment rule. 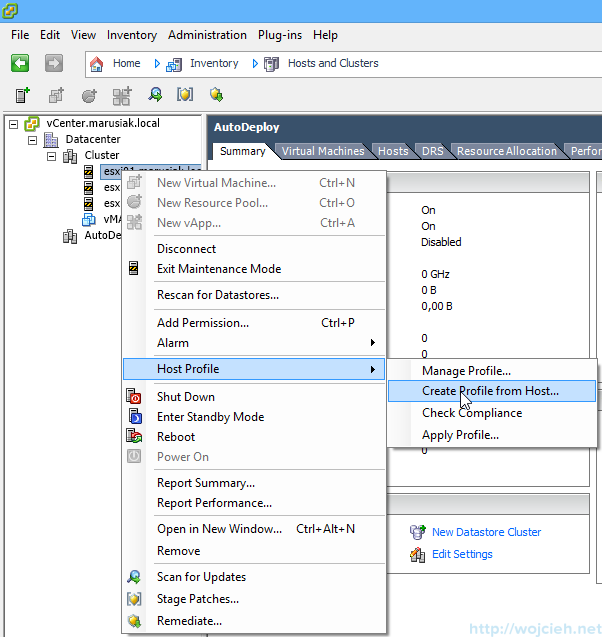 Where: -name is Rule name -item is Image Profile name, AutoDeploy is Host Profile name and Cluster2 is cluster name in vCenter. -Pattern might be vendor ID or IP range. New-DeployRule -name "ESXi5.5-Normal" -item "ESXi_5.5", AutoDeploy, Cluster2 -Pattern "ipv4=10.0.0.150-10.0.0.160"
Now we need to activate rule by typing. As you see on screenshot during boot Host Profile settings are applied. All three ESXi hosts are booted using Auto Deploy. In order to complete our setup, we need to update Answer File. 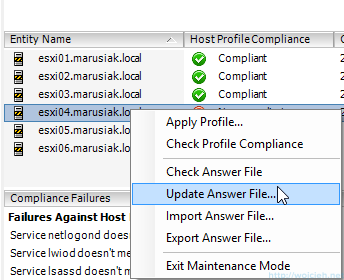 Click on the host and select Update Answer File. As you see on screenshot Cluster2 is compliant with host profile. Before we will finish the post with Cherry on Top let me explain what is stateful and stateless caching. 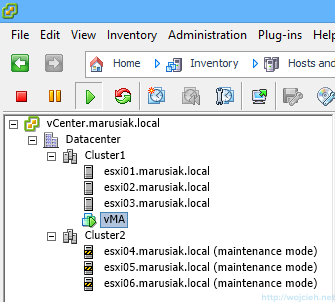 Stateful means that ESXi is deployed using Auto Deploy and image is saved to hosts internal storage. It can be a traditional hard drive or USB disk. First boot is initiated using network boot and image is deployed locally. Boot order on a host is set to boot from a network during first boot and later on, disk should be set to first. After other reboots disk is used to boot ESXi. Stateless means that ESXi is deployed using Auto Deploy and image is cached to local USB. The host is using network boot, boot order is set to network first. 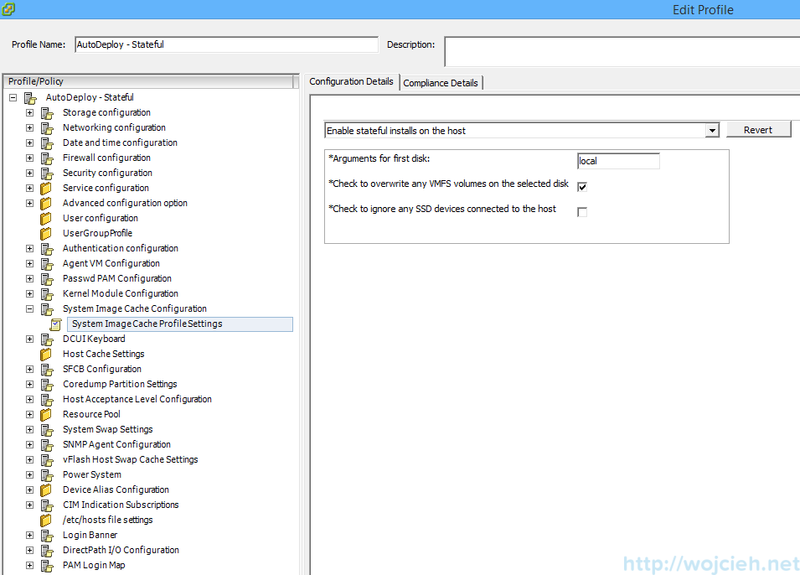 In order to deploy Stateful ESXi, we need to select in section SystemImageCacheProfileSettings several settings. First, we select Enable stateful installs on the host, second thing is to give arguments for the first disk. In our case local is correct setting – you can provide your own parameters. 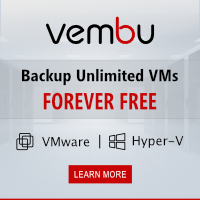 We want as well to overwrite VMFS on existing disk. Here we see what changes will be applied to ESXi. And we have summary after Host Profile was applied. In order to deploy Stateless ESXi, we need to enable it in section SystemImageCacheProfileSettings. First, we select Enable stateless caching on the host, second thing is to give arguments for the first disk. In our case local is correct setting – you can provide your own parameters. After applying host profile and reboot, our host is compliant. How do we check if it is really cached and not boot from disk? Simply we can see in host settings that it has only two iSCSI disks and CD-ROM. I removed as well disk from ESXi4 on purpose. I am facing issue . trying stayful method and trying to i have image in local disk and i have mentioned local in arguments for first disk but when i boot via HDD its failing , FYI i added the local disk as a datastore , Pls explain in detail whether i missing anything here.. It got resolved, i found the local kernel driver name for my disk ( HP smart array ) is hpsa..Once i updated hpsa instead of local it worked….i used below command to find the driver name…esxcfg-scsidevs -a or esxcli storage core adapter list…. Glad to hear it Ganesh. 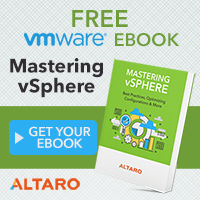 Copyright (C) 1998-2014 VMware, Inc. All rights reserved. Set-PowerCLIConfiguration : You must specify at least one parameter. From what I see you are using some kind of script. Please try to follow my guide step by step and it will work. Dzieki za bardzo dobry material! Super! Cieszę się, że podobał Ci się wpis. 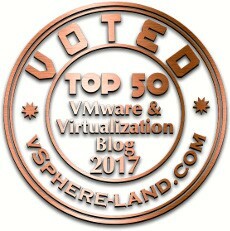 Please find it on VMware website. Thanks for the steps. This is very useful. I am trying to attach few vibs to the image profile which is not present by default. I am able to add software dept and later attached the vib using add-esxsoftware package to image profile. When i tried to new-deploy rule i am getting below error. Could you help me out?? Above error says some temp file already opened and hence gives error. If i remove the added vib from image profile, Above step is successful. I suggest to run PowerCLI console as Administrator and second thing might be permissions error where the source file is located. I am able to fix it by marking signature check as true .Mentioned below. I got another question. Can I have multiple deploy rules get activated?? I got multiple host. I wanted each host to boot with different deploy rule.